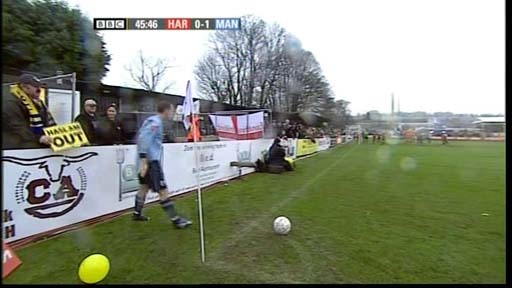 Mansfield Town put in a competent display in front of the live BBC1 TV cameras on Sunday afternoon. After a scrappy opening by Mansfield, in which Railway hit the bar, the Stags gradually got on top and put together some good football for the last 25 minutes of the first half, deservedly taking the lead on 38 minutes through Gareth Jelleyman. The Stags continually stretched Railway in the second half scoring twice more through Michael Boulding and it was surprising when the home side pulled goals back to make it 1-2 and 2-3. Despite the score, this was an easy win for the Stags although keeper Muggleton had to make a good save in stoppage time. 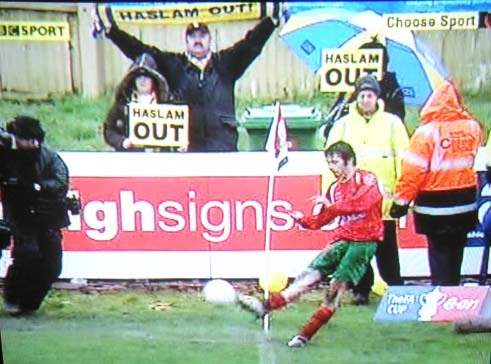 Stags fans were incandescent with rage about the antics of owner Keith Haslam and protests were clearly visible and audible on the BBC TV coverage. The Stags were unchanged from the defeat at Rochdale. In muddy conditions and on a pitch with a pronounced slope, the Stags started poorly and after only 3 minutes there was a scare when Scott Ryan's free kick hit the top of the bar, with Muggleton badly out of position. The Stags continued to play poorly but on 17 minutes Dawson put a good ball in and Michael Boulding headed wide. The Stags started to play a lot better, and on 34 minutes a good move ended with Martin putting in a good ball from the left and Michael Boulding heading wide. Two minutes later, Rory Boulding put in a decent shot after a good run, which was saved by the keeper at full stretch. A goal was coming, with Bell and Dawson commanding in the middle, and it arrived a couple of minutes later. Dawson fed Bell, who played a neat ball to Michael Boulding just inside the box. Boulding's shot was blocked to Jelleyman who shot at goal from 9 yards. The keeper parried the ball out to a defender who tried to clear, but it rebounded off Jelleyman and in off the far post. It was a lucky finish, but a good move. In the first minute of the second half, Hamshaw fed Rory Boulding who took time to fashion a shooting chance for himself on the edge of the box, and his right footed effort forced the keeper into a good save. It was 2-0 on 51 minutes. Baptiste's long ball from the back was headed on by Rory Boulding into the path of Michael Boulding who was through in a 1-on-1 with the keeper. Boulding's record from such positions has not been good this season, and he dallied too long and was lucky that his shot was deflected by a defender just past the keeper's outstretched hand and rolled into the bottom left corner of the net. Without the deflection the keeper would probably have saved it. On 55, a great Stags move ended with the miss of the season by Jelleyman. Dawson played it to Michael Boulding who passed to Rory Boulding, who in turn fed it back to Dawson. Dawson's goalbound effort was blocked into the path of Jelleyman who simply couldn't miss an open net from 5 yards. But he put it over the bar. On 58 minutes, Michael Boulding made a great turn on the edge of the box and his excellent effort was saved by a diving keeper. It was all Mansfield, but on 60 minutes a real goal out of the blue brought Railway back into it. Substitute Davidson, on the field for a minute, rose above Buxton and Baptiste, to head into the roof of the net. On 61, Michael Boulding was brought down in the box right on the byeline. TV replays showed it was a clear penalty, but it was not given by the hapless officials who made so many mistakes on the day that I lost count. It was 3-1 on 76 minutes. Bell cleverly stepped over Dawson's forward ball, and Brown, who had just replaced Rory Boulding, slipped a neat ball across the six yard box for an unmarked Michael Boulding to fire under the keeper. There was a very rare chance for Railway on 82 minutes as Morgan headed wide from a free kick. But incredibly it was 3-2 on 84 minutes. A corner from the left wasn't cleared, and Marshall played a clever pass across the box to Davidson who side-footed first time into the net from 12 yards. In the first of 5 minutes of stoppage time, Muggleton earned his money by making a good save from Davidson's curling shot after a good turn on the edge of the box. The Stags went straight to the other end and Brown was brought down on the angle of the penalty box by the keeper. It was hard to tell even from the replays whether it should have been a penalty - to be honest the decision could have gone either way, but the referee waved play on. The Stags comfortably held on for a deserved success. It was a good game and a good spectacle for the TV viewers. The Stags can be happy with their day's work, particularly Dawson, Bell, Michael Boulding, Hamshaw, Baptiste and Muggleton. 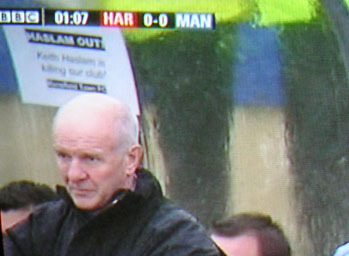 Stags fans everywhere are feeling just awful with the thought that the greedy and despicable Keith Haslam looks like he will be remaining as the owner of the club just when we thought that James Derry would take it way from Haslam's grubby paws, but at least this was an enjoyable occasion. Muggleton 7 Good save at the end to preserve the victory. Lucky with the early free-kick against the bar. Baptiste 7 Fine game. Looked composed and classy. Martin 6 Worked hard and one good cross. Jelleyman 6 Lucky goal and missed the sitter of the season. Not impressive. R.Boulding 6 Did ok and linked well with his brother. M.Boulding 7 Another two goals. Led the front line well. Brown (for R.Boulding, 74) - Good cross for the third goal. Subs Not Used: White, McIntosh, McAliskey. Mclaughlin, Haigh, Robert Morgan, Riley (Blair 70), Lowe, Littlefair, Adam Jones (Conway 60), Scott Ryan, Matt Morgan, Marshall, Smith (Davidson 60). Subs Not Used: Turner, Thirkall. Mike Pike (Cumbria) 5 An astonishing number of wrong decisions by the officials.